Miyuki Ishikawa a Japanese midwife and serial killer known as the Oni-Sanba (Demon Midwife). Miyuki's murdered between eighty-five and one-hundred-sixty-nine infants between 1944 and 1948. She was an experienced midwife and worked as a hospital director at the Kotobuki maternity hospital. The police initially found five dead bodies and later found over forty dead bodies in the house of a mortician. Thirty additonal bodies were later discovered in a temple. Miyuki and her husband Takeshi Ishikawa were arrested in 1948. Miyuki Ishikawa a heterosexual female citizen of Japan. She completed 16 years of school, received a college degree. She gained part of her education while attending University of Tokyo. She married Takeshi Ishikawa. She had no children. In 1944 Miyuki Ishikawa started her killing spree, during her crimes as a serial killer she was known to murder her victims. At the time of her crimes she was living with her husband Takeshi Ishikawa, where she was known to work as a midwife, nurse, serial killer. She was arrested on January 15th 1948, sentenced to eight years imprisonment, later dropped to four years at a prison in Tokyo, Japan. She was convicted on charges of murder and other possible charges during her lifetime. Miyuki Ishikawa has been listed on Killer.Cloud since March of 2019 and was last updated 1 week ago. The following serial killers were active during the same time span as Miyuki Ishikawa (1944-1948). Miyuki Ishikawa (石川 ミユキ, Ishikawa Miyuki, born 1897, date of death unknown) was a Japanese midwife and serial killer who is believed to have murdered many infants with the aid of several accomplices throughout the 1940s. It is estimated that her victims numbered between 85 and 169, however the general estimate is 103. Q1999446 on www.wikidata.org, Retrieved on Mar 17, 2019. Miyuki Ishikawa on en.wikipedia.org, Retrieved on Mar 17, 2019. Juan Ignacio Blanco, Miyuki ISHIKAWA on murderpedia.org, Retrieved on Mar 17, 2019. 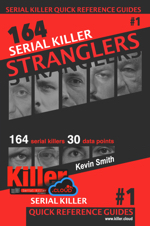 Serial Killers Statistics, charts Miyuki Ishikawa is included in: Serial Killers By Gender, Serial Killers IQ Level, Highest Degree Achieved, Sexual Preference, Active Serial Killers by Year and Statistical Boolean Questions.